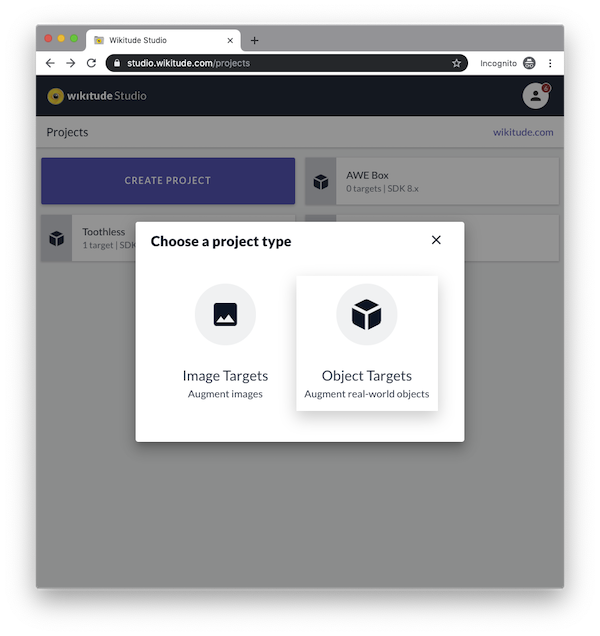 This guide gives you an overview of how to create a target collection that you can use to detect and track images within your augmented reality experience. Wikitude Studio Manager: A browser based tool to convert your images to a wtc file. You can find the tool under: https://targetmanager.wikitude.com. You need your free developer account to log-in. This tool is described in more detail further below. WTC Editor within Unity Editor: The Wikitude Unity plugin installs a WTC Editor as an extension of the Unity Editor. Unity developers can manage all their targets and target collections directly within Unity Editor. Please consult the Unity documentation for more details. Targets Enterprise Script: A binary shell script available for Mac OS X and Linux converting images to target collections. Pleases contact Wikitude Sales team for technical requirements and pricing. The following images describe the relationship between the above mentioned methods and the Wikitude Cloud Recognition Service, which is not the scope of this documentation. 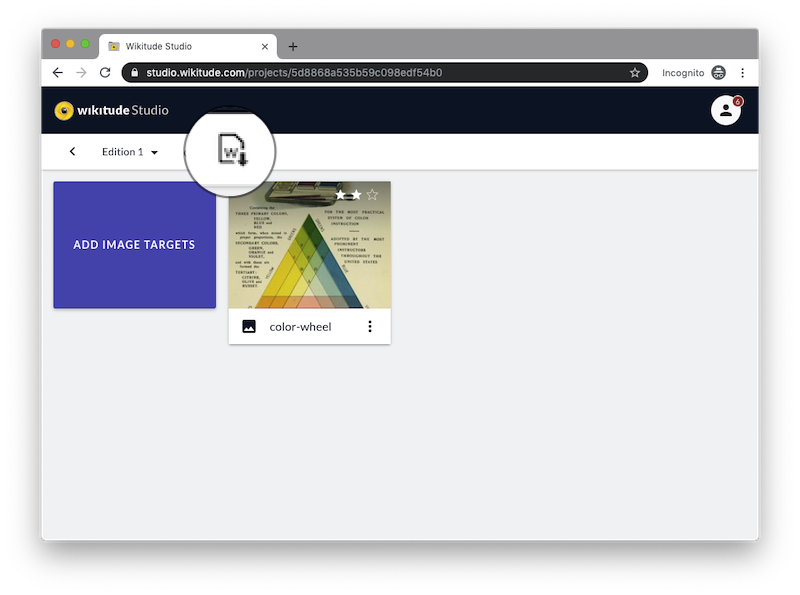 Add new target images to the project either by clicking on Add Targets or drag & drop them on the empty area. Supported file formats include PNG and JPEG. If you are using PNG images, please make sure that it does not contain any transparent pixels, only solid colored images are supported. When uploading a target the file name is used as target name. It identifies a target in your experience. If the target name is not completely visible, hover over it to reveal the full name or double-click the target to enter edit-mode. If you add your own target images you need the target name to set them in AR.ImageTrackable. 0 stars: Not suitable for tracking. This target image cannot be tracked because it lacks textured features with high local contrast. Please consider choosing another target image. 2 stars: Good tracking ability. This target image will track well in most conditions. 3 stars: Very good tracking ability. This target image will track very well in most conditions. AR.TargetCollectionResource WTC (Wikitude Target Collection) file which contains all information of the targets that should be recognized. Enter the project you need the file for and click the WTC icon in the toolbar. Select the Wikitude SDK version you're using and click Generate to trigger the creation of the WTC file. You will be notified via e-mail once the file is available for download. Click the Cloud icon in the toolbar for more details. You may unpublish a project at any time but be aware that this action has an immediate effect on your application(s) making use of the credentials. Metadata in the 'Edit Target' dialog is solely relevant for Cloud Recognition whereat Physical Height is only relevant for the distanceToTarget feature. Leave Physical Height empty if you do not use the distanceToTarget feature of AR.ImageTrackable. The Metadata field is very useful. It allows you to attach JSON data to a target. That way you can define any kind of additional data and react to it dynamically in the SDK to e.g. let a button refer to a details page which is defined in the Metadata JSON. The Wikitude SDK only requires the actual height of the target image as information. The width of the actual image will be determined automatically. Wikitude Studio is the universal way to add target height information. 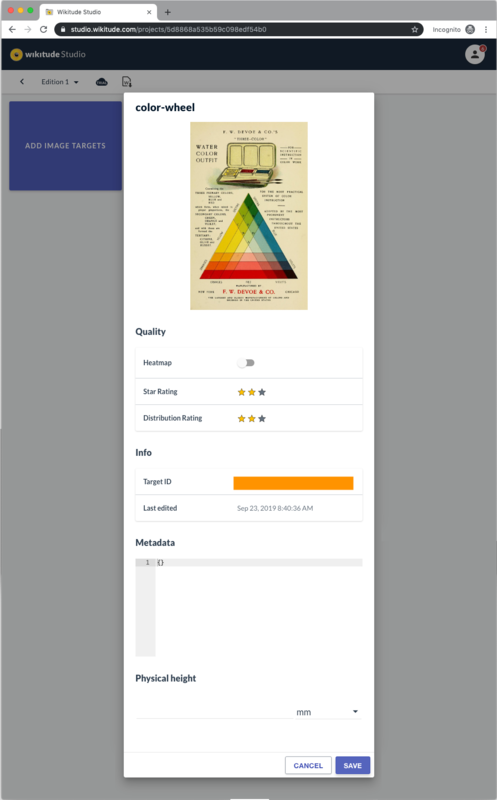 The tool allows adding the value of each image. The height information (physical target height) is then stored as part of the Image Target Collection (.wtc) and will be then automatically applied in the SDK. The WTC Editor included in the Unity Plugin of the Wikitude SDK also includes an option to set the physical target height (Target Height), which then stores the value into the .wtc file. The object recognition feature in the Wikitude SDK works in a similar way than image recognition. It tries to find and match a pre-created reference in the live camera image. This pre-created reference is called Object Target. Sometimes we refer to it as a map as it is a pre-recorded SLAM map. 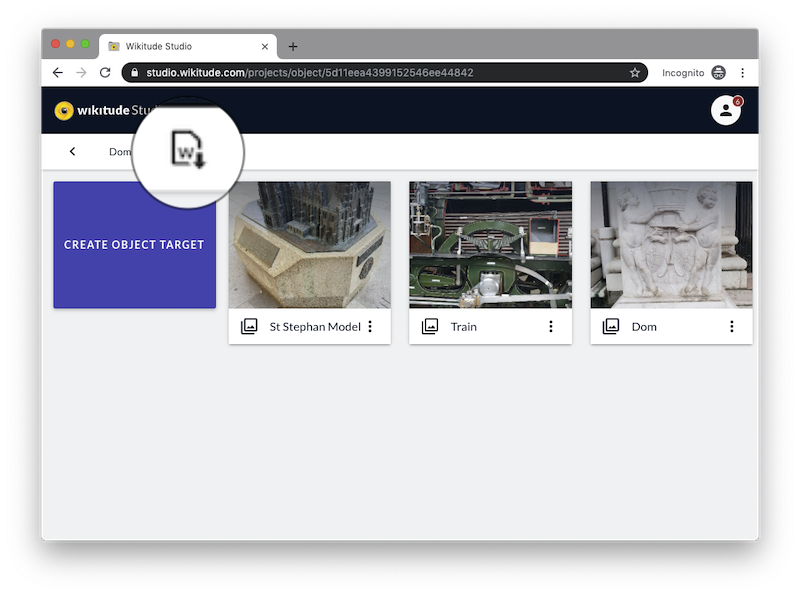 Starting with version 8.0 of the Wikitude SDK, Object Targets can be created using videos or images (preferred) as source material. The source material is converted into a Wikitude Object Target Collection, which is stored as .wto file. Use the .wto file in your app project. In the following chapters, we describe video-based and image-based methods in more detail. 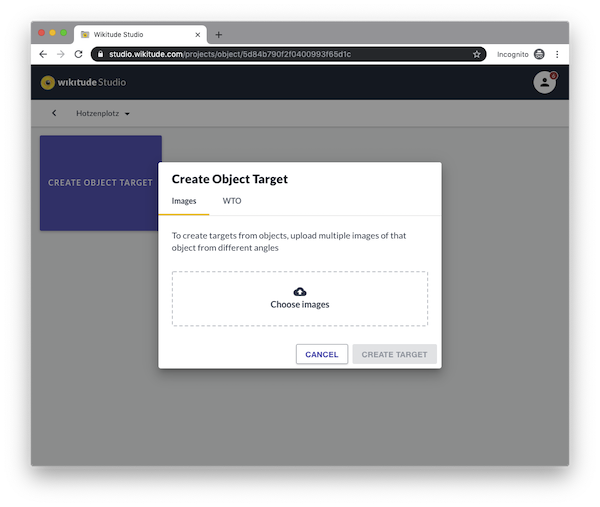 Starting with version 8.0 of the Wikitude SDK, Object Targets can be generated from a set of images, instead of a single video. This approach has several advantages over the video-based conversion. For that, we recommend image-based conversion as the preferred method. It will always produce better results compared to the video-based conversion. The first step is to collect images from your object. This step is essential, as the source material will determine the quality of your Object Target. In general, it does not matter where the images originate from - either manually taken or generated and rendered in a 3D/CAD software. Please refer to this guide for a detailed list of recommendations which images to use. 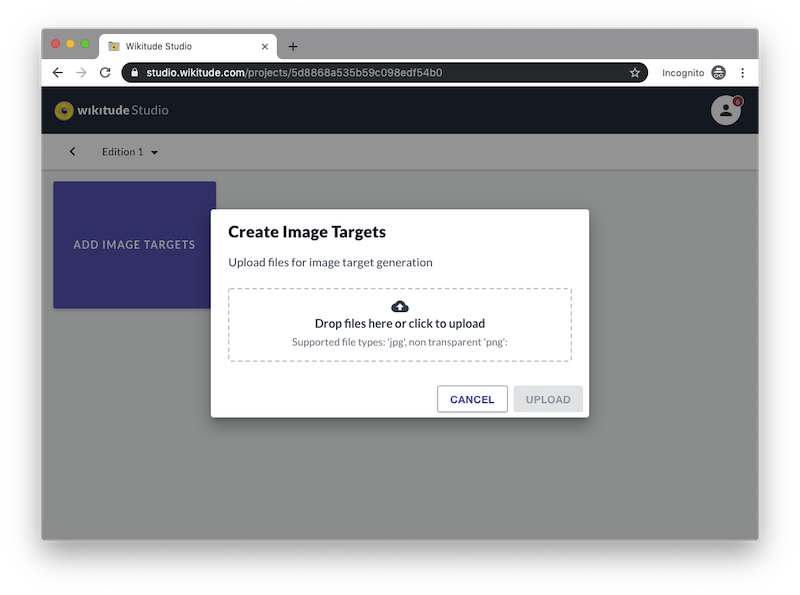 You might have used Studio Manager already when working with Image Targets. 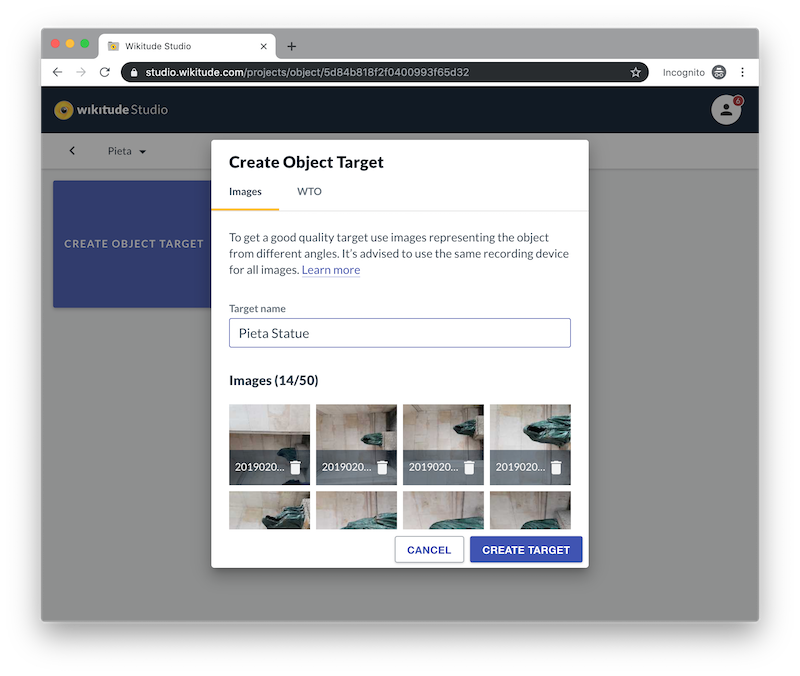 Studio Manager is a free web-tool that helps you manage your Targets that are used in combination with the Wikitude SDK. Upload the set of images you want to use. When you enter the FoV manually, make sure you enter the horizontal FoV. Vendors tend to show-off their devices with a combined diagonal FoV, which is the largest value. Do not use diagonal FoV but only horizontal FoV. Automatic detection of FoV value: For image-based conversion the service will try to identify automatically the FoV value of every image that you upload. It is doing so by reading out EXIF data that are stored together with your JPEG images. 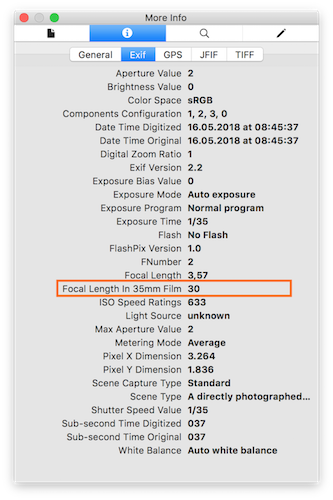 In case either one of the the following EXIF properties is set correctly, the conversion will use this value, no matter which value you provided in the web interface. Wait for conversion to be finished. You will also be notified via email once the process has finished. 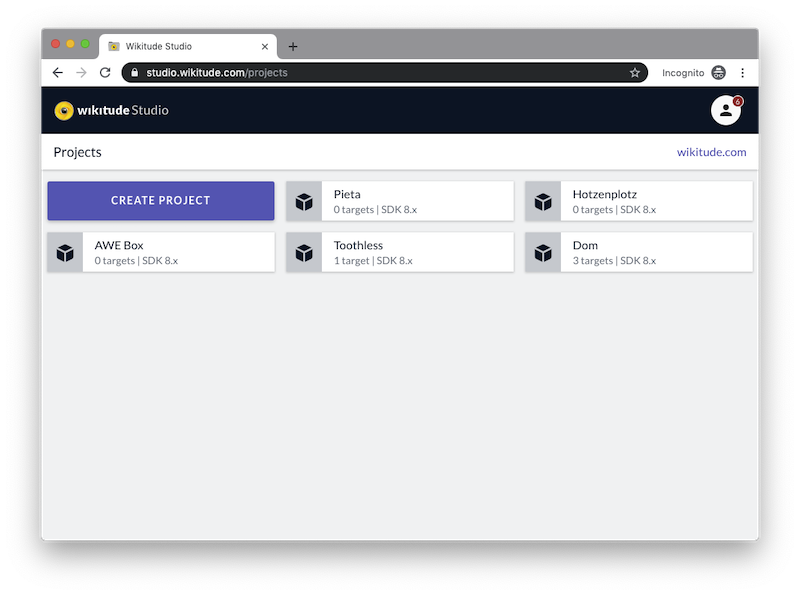 Studio Manager can also be accessed through a RESTful API. 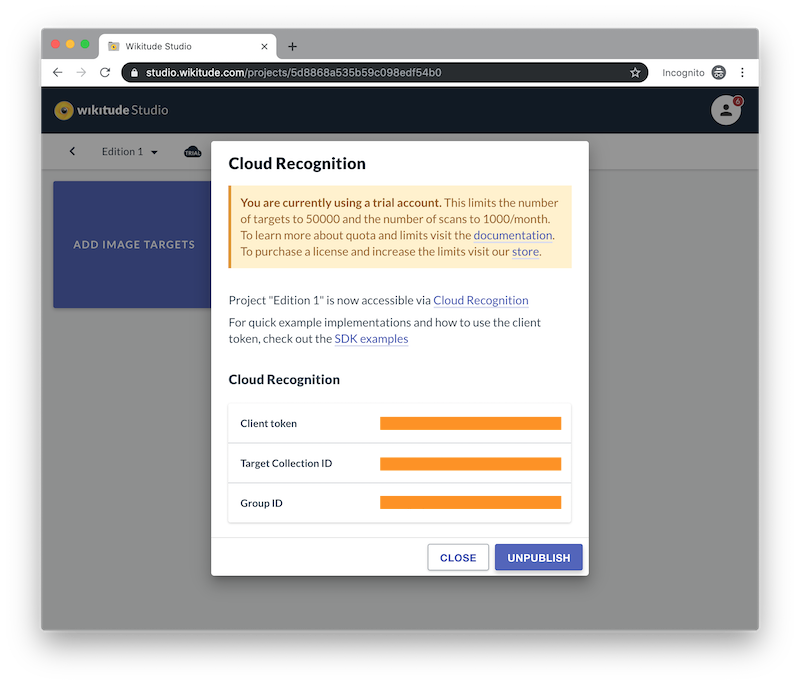 The API is part of the Cloud Recognition Manager API. Wait for conversion to be finished - the service is performing several runs in the background to find the best possible configuration for your video. The conversion will minimum take 3-times the video run length. So a 50 seconds video will take minimum take nearly 3 minutes to finish. Depending on the current load, this can also take longer. You will be notified via email once the process has finished.